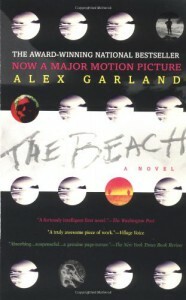 For me “The Beach” does not fall into any specific genre. I think it is part philosophy, horror, thriller and adventure story. It is also funny as hell. Richard and his friends find a secluded beach in Thailand with a community of hippies. Richard is a young backpacker on vacation when he finds the mythical beach. The inhabitants on the island live there secretly but let Richard and his companions join them. On the camp there is a longhouse and huts scattered about. Everyone is put in a work division. They swim during their free time. They play soccer. They play video games. They smoke copious amounts of dope. Families and a life back home don't seem to exist. A barred off island with no rules seems like paradise. It also reads like paradise. When fishing at night Richard sees phosphorescence glowing underwater. One day after getting lost on the island he is surrounded by a troupe of monkeys who wrangle food out of his hand. Their island is next to another island with a dope field guarded by a group of armed Taiwanese. Richard notices his camp seem less scared of the guards than their community being discovered. This self-containedness takes an even darker turn when most of the camp decide to leave a kid dying from a shark attack than risk getting caught. Throughout his stay Richard can’t stop the recurring image in his head of a dead man he encountered before his journey. He calls him “Mister Duck.” My interpretation is that Duck is his conscious, a way to cope with the unraveling of the utopia he thought he found. More and more he is suffering from deindividuation, losing his voice and his self. Garland has spoken little about this book, or at least I could find little he said. Which is a shame. But it might also be wise. I have read him say, when : "I can't lift it up or put it down because it is what it is." I like that, because it is simply put. Any art is subjective, because the interpretation belongs to the beholder. So I see it like this. I have lived somewhere in Garland's story before. I have swam similar shores. This book is about youth.